Landfill disposal of synthetic plastics poses one of the biggest threats to the environment due to their non-biodegradability. This problem can be solved by production and use of biodegradable polymers instead. Feathers are a renewable, inexpensive, biodegradable, and easily available by-product of the poultry industry. They have long been considered as a solid waste that poses a serious environmental and economic problems. Avocado seeds are an organic waste that is also disposed of by landfilling. The aim of this study was to beneficiate these two organic wastes via development of green biofilms prepared from starch and keratin extracted from waste avocado seeds and waste chicken feathers, respectively. The films were then studied for their morphological structure, fine detail structure, crystallization behavior, functional group content, moisture content, solubility, tensile properties, moisture regain, and dissolution characteristics. Data on dissolution, water absorption, solubility, moisture content, mechanical properties and morphological structures of the keratin/starch blended films imply that the films could be used in the food packaging industry (as a cost-effective and environmental alternative source of raw material to the commonly used petroleum based materials used in packaging materials; as a raw material in the manufacture of hygiene products, e.g., superabsorbent materials for diaper products; and as a source of raw material for manufacture of biomedical products such as artificial skin products; and in the pharmaceutical industry (e.g., in drug delivery systems). Plastic packaging are ideal materials for many commercial and industrial activities especially in food packaging where they are used to help keep food fresh and free of contamination. This is due to their lightness, flexibility, stability, strength, impermeability characteristics . The consumption of synthetic polymers to produce plastics is expected to grow four-fold (25% of oil production) in 2100 due to the growing human population and increasing demand for packaging materials . Accumulation of post-consumer waste due to non-biodegradability of plastics is a serious environmental problem of using plastics for packaging that cannot be solved by landfilling . Plastic waste can be incinerated for energy recovery, but this has negative environmental impact due to greenhouse gas emissions during burning of the plastics [4,5]. In order to reduce the environmental impact of synthetic polymers partially biodegradable polymers have been prepared from a mixture of synthetic and natural polymers. Recently, increased attention has been focused on replacement of synthetic polymer-based films with eco-friendly bio-based biodegradable packaging films for applications in food packaging, drug delivery systems, and tissue engineering [6-9]. Replacement of synthetic plastic packaging by biodegradable polymers from renewable biomass significantly reduces the volume of waste generated [10,11]. Although bio-based plastics have some limitations in terms of their mechanical properties, their thermal resistance and water barrier function characteristics offer very desirable features [12-14]. Recently it has been reported that 100% biodegradable packaging materials can be produced from renewable sources such as starch [2,6,14], proteins, cellulose, and rubber [15-20] and lipids [21-23]. Keratins are desirable proteins due to their environmental stability, biodegradability, and biocompatibility characteristics. The abundant cysteine amino acids in keratin are oxidised to give inter- and intra-molecular disulphide bonds, and they form a three-dimensional crosslinked network that results in high mechanically strength, hydrophobicity and good thermal stability characteristics [24-29]. Thus, these qualities could led to development of biodegradable materials from feathers, such as films, sponges, self-assemble structures, hydrogels for compostable packaging products, tissue engineering, fibroblast cell growth, wound healing trauma and drug delivery systems [30-36]. One of the renewable source of keratin is waste chicken feathers which has about 8.5% cysteine content . Keratin films are highly ductile and have low flexibility . Starch is a completely biodegradable semi-crystalline polymer and a supplementary material for most plants. Waste avocado seeds can be beneficiated as a viable, relatively cheap, and readily available renewable source of starch . Although there are some reports on production of keratin-starch films, to the best of our knowledge, there are no reports on production of avocado seed starch cross-linked keratin materials. This work highlights utilization of biodegradable polymers from renewable resources (starch from waste avocado seeds and keratin from waste chicken feathers) in the production of keratin/starch blended films. Chemicals: Urea, Calcium hydroxide, sodium dodecyl sulphate (SDS), and hydrochloric acid were purchased from Sigma Aldric, South Africa. Feathers: Chicken feathers were obtained from Rainbow Chickens Limited, a slaughterhouse in the province of KwaZulu-Natal, Durban, South Africa. Avocado seeds: The seeds of avocado fruit were collected from Durban, South Africa. Starch extraction from waste avocado seeds: FIG. 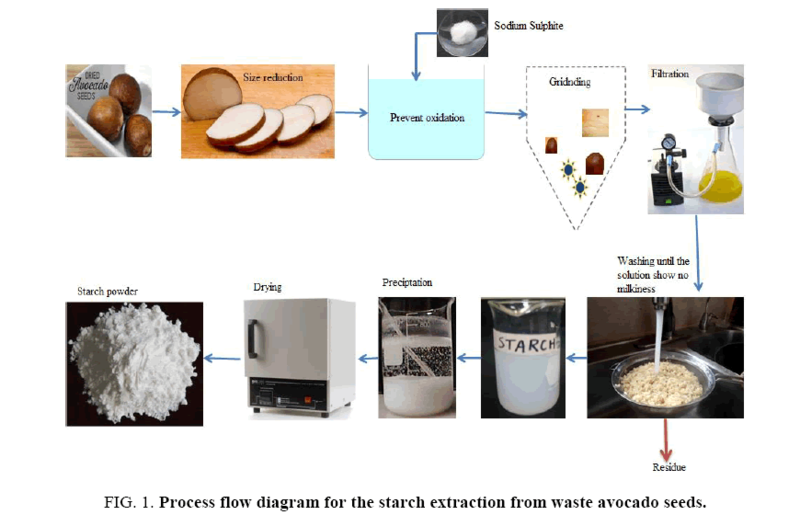 1 is a schematic of the process flow diagram for the extraction of starch from waste avocado seeds. Waste avocado seeds were washed with tap water and ground to a fine powder that was then steeped at room temperature in a sodium sulphite solution and blended using a heavy-duty blender. The homogenate mixture was then sieved using a 20 μm nylon mesh and washed with de-ionized water. The mixture was allowed to settle, the supernatant was discarded, and the crude extracted starch was washed repeatedly with tap water until the wash water was clear. The filter cake was then dried at 50°C for 24 h and stored at room temperature. FIG. 1. Process flow diagram for the starch extraction from waste avocado seeds. Pre-treatment of chicken feathers: FIG. 2 represents the process flow diagram for decontamination and pre-treatment of waste chicken feathers. Freshly plucked wet untreated chicken feathers were purified by washing with a 1% of the weight of the chicken feathers SDS to remove the grease, other wastes and kill potential harmful pathogens. Untreated waste chicken feathers (10 g) feather samples were placed in a beaker to which was added the SDS solution at a liquid to solid ratio of 40:1. FIG. 2. 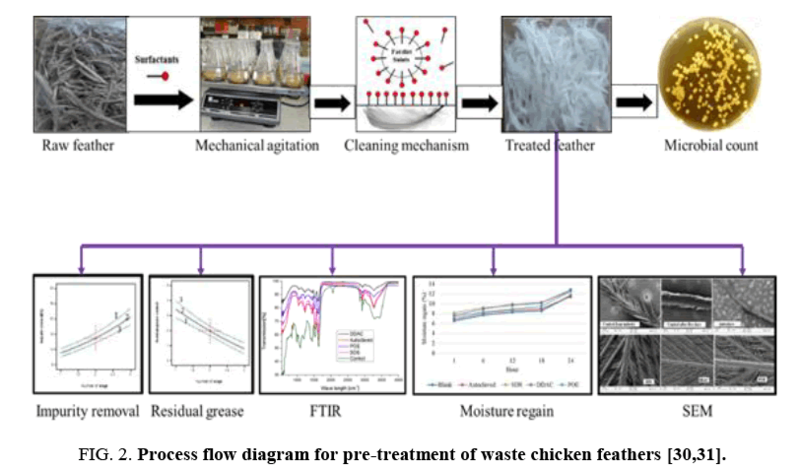 Process flow diagram for pre-treatment of waste chicken feathers [30,31]. The sample was agitated at 500 rpm using a magnetic stirrer with the beaker on a hot plate maintained at 50°C for 30 min. The treated feathers were further purified by rinsing in distilled water for 10 minutes and then laid on aluminum foil and dried to a constant mass at 100°C in an air-forced dryer. Thereafter the sample was placed in plastic bag that was sealed and then stored in a controlled laboratory environment (20°C, 65% relative humidity). The decontaminated and treated feathers were then pulverized to 350 μm size using a heavy-duty milling machine before use to increase surface area. FIG. 3. Process flow diagram for extraction of keratin extraction from chicken feathers. • Store keratin powder at 4°C until ready for use. 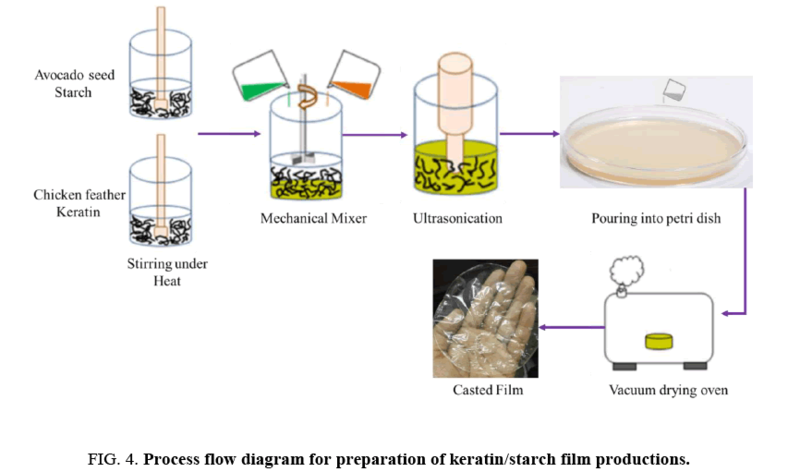 Preparation of starch-keratin blended films: A process flow diagram for preparation of keratin/starch blend films is depicted in FIG. 4. An aqueous starch solution was prepared by adding 5 g starch powder to 100 g de-ionized water (5% v/w) under constant stirring, with a magnet, at 70°C for 30 min. A 7 g sample of keratin powder was added to 100 ml of 0.1 M NaOH and then heated at 70°C for 15 minutes with constant stirring with a magnetic bar. Then, various ratios of keratin/starch solutions and glycerol were mixed as shown in TABLE 1 below. Glycerol is a common plasticizer used in the preparation of bioplastic films. The mixtures were heated at 70°C for 10 min with continuous magnetic stirring to prepare keratin/starch blend dispersions. TABLE 1. Proportion of starch and keratin. FIG. 4. Process flow diagram for preparation of keratin/starch film productions. The dispersions were sonicated for 5 min to remove bubbles to form homogenous dispersions that were poured into glass petri dishes (15 cm diameter) and dried in a vacuum oven at 60°C for 24 h. After drying, the films were peeled from the petri dishes and conditioned at a relative humidity of 65 ± 2% and a temperature of 20 ± 2°C for 24 hours before analysis. FTIR spectroscopy: The functional groups present keratin/starch blend films were recorded using FTIR in the attenuated reflectance mode (Frontier Universal, PerkinElmer) and recoreded at a resolution of 4 cm-1 in the wave number range of 600 to 4000 cm-1 and each spectrum contained an average of 4 scans. Morphological and fine detail analysis: The morphological structure of keratin/starch blend films were examined by scanning electron microscopy (SEM) at an acceleration voltage of 20 kV using a Carl Zeiss instrument (Oberkochen, Germany). Atomic Force Microscopy with a Solver P47H base with a SMENA head (NT-MDT) was also conducted to characterize the fine detail structure and roughness of the films. where W1 is the initial mass of the film and W2 is the constant mass of the film after drying. Tensile properties of films: The mechanical properties of keratin/starch blend films were measured using a Universal Instron Tensile testing machine (Model 3345) according to the ASTM standard D882. Dissolution of films: A dissolution percentage of the keratin/starch films were performed in a 0.1 mM phosphate buffer saline solution (pH 7.4) at 37°C for 7 days. The buffer was changed every 24 h and the extent of dissolution was calculated using equation 6 after drying at 50°C for 24 h.
Thin, transparent, homogeneous, and flexible films were obtained from all keratin/starch blended films. Their colour varied from white to yellow. Increase in keratin content in the film resulted in increased yellowness of the films. Initial observations were that the keratin/starch blended films without plasticiser were brittle at low humidity and soft at high humidity. The mechanical properties of the films were improved. In order to improve the brittleness of keratin/starch blend film glycerol i s incorporated in the blended solution. It was observed that the addition of glycerol increases the flexibility, homogeneity and transparency of the film by reducing the internal hydrogen bonding between polymer chains. Their surfaces appeared smooth without visible cracks or holes. These films show higher flexibility, whiter colour, homogeneous in surface appearance and sticky during peeling off the film from the plate due to the hygroscopic nature of starch, as the starch content increases. 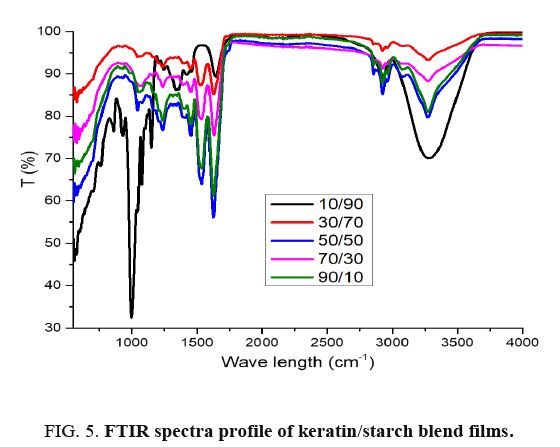 The infrared spectra of keratin/starch blended films are depicted in FIG. 5: it is clearly evident that there were shifts in the spectra due to interaction between the amino acid functional groups of keratin molecules and hydroxyl groups in the starch molecules. The absorption peak at about 900-1000 cm-1 represents di-sulphide bonds in keratin and its intensity increases as keratin content in the films increases. The major absorption peaks are displayed in TABLE 2. TABLE 2. Major functional groups identified in keratin/starch films. FIG. 5. 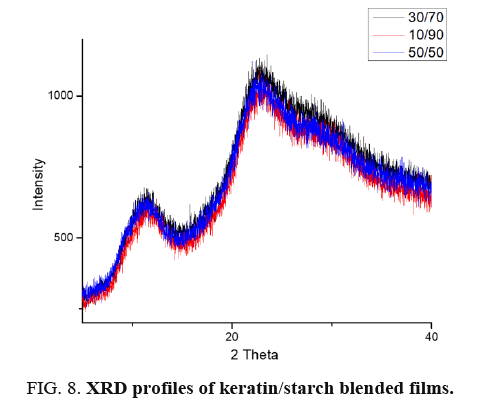 FTIR spectra profile of keratin/starch blend films. 10/90 keratin/starch film showed absorption peaks at 900-1000 cm-1, 1250 cm-1, 1550 cm-1, 1660 cm-1 and 3100-3600 cm-1 corresponding to saccharide, C-O stretching, N-H, C-C O-H or/and N-H stretch functional groups. The keratin/starch film showed the presence of absorption peaks about 800 cm-1, 1200 cm-1, 1550 cm-1 and 1680 cm-1 and these represents amide IV, III, II (NH bending) and I (C=O stretching) respectively. The presence of band about 1700 cm-1 in the keratin/starch suggested carbonyl group. Due to the interaction of hydroxyl groups (-OH) in the starch molecule and the amino groups (-NH2) or carbonyl group (C=O) of the keratin protein, the keratin/starch blend films showed absorption peaks about 2900-3250 cm-1. The peak near 2900 cm-1 suggested the presence of C-H stretching. The presence of broad band about 3000-3500 cm-1 was an indicator of OH and/or NH stretching. Scanning electron microscopic (SEM): The morphological structures of obtained keratin/starch film surfaces are presented in SEM images in FIG. 6. It is evident that the morphological structures of keratin/starch films are affected by the chemical composition of the films. It could be also concluded that the surface morphology and texture of keratin/starch blend films were depended the ratios of keratin and starch used. It is observed that the roughness of the surface of keratin/starch blend films increases as the starch content increases and the structure of the film is porous like sponge texture. While as the keratin content increases the surface become smooth surface with non-homogeneous texture and granulates were embedded and merged, this could be due to the high range of molecular weight distribution of the keratin protein. FIG. 6. 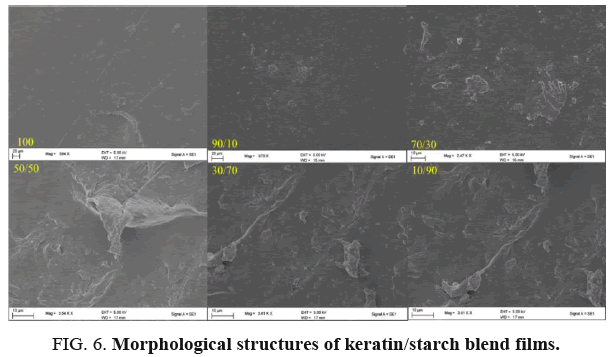 Morphological structures of keratin/starch blend films. All keratin/starch blend film except 90/10 keratin/starch blend comprises of high starch content, which are mainly similar monomer but high molecular weight difference with keratin and the surface of the film becomes rough with homogeneous texture. It was not possible to observe any significant morphological structure difference between 30/70 and 50/50 keratin/starch film and showed one more sponge cross-sectional structure which could be due to the functional group similarities of the films. The sponge like texture might be caused due to the evaporation of water molecules that reacted with various hydroxyl groups in the starch. All keratin/starch blend films have sponge texture and this could be due to the presence of hydroxyl group in the starch, and this group can interact with water through hydrogen bond during drying of the films. Fine detail structures: To further clarify the surface roughness of the keratin/starch films the fine detail structures of the films were investigated using Atomic Force Microscopy (AFM). 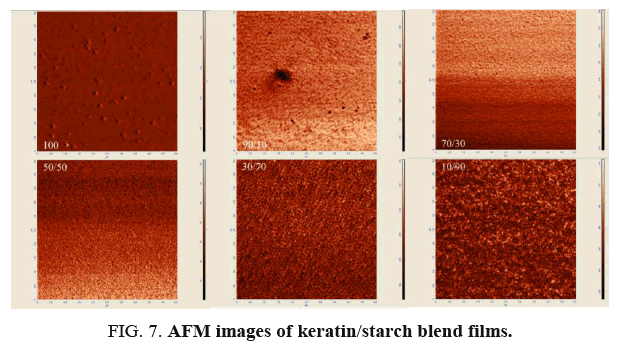 The AFM images of the keratin/starch blend films are shown in FIG. 7. The 100% keratin film exhibited a non-homogeneous, compact structure with aggregates embedded on the surface probably due to agglomeration of keratin proteins. Addition of increasing amounts of starch in the blends produces films with homogeneous and compact microstructures due to inter- and intra- molecular crosslinking of keratin proteins with starch molecules. The roughness of the blended films could be due to the difference in molecular weight distribution of keratin and starch molecules. FIG. 7. AFM images of keratin/starch blend films. X-ray diffraction (XRD) of films: To further clarify the effect of keratin/starch addition on the properties of the films, XRD analysis was investigated. XRD analysis was used to study crystallinity properties of the films. Diffraction peaks in the XRD pattern of the keratin/starch blended films are shown in FIG. 8. They show broad diffraction peaks at 2θ values of ∼9 and 20°, which are typical patterns of partially crystalline materials. The diffraction pattern intensity and peak width of higher starch content films is stronger than other samples indicating an increase in crystallinity behavior. From the crystalline peaks, the crystallinity indexes were calculated based on equation 1 and the results all keratin/starch film were completely amorphous structure with crystallinity index of less than 20%. FIG. 8. XRD profiles of keratin/starch blended films. Solubility test of films: The solubility profiles of keratin/starch blended films are shown in FIG. 9. Solubility of the films increased with increase in starch content in the films. This could be due to hydrophilicity of hydroxyl groups in the starch polymer starch-higher amounts of starch will lead to higher solubilities of the films in water. This seems to imply that higher starch content in the blends results in reduced cross-linking reactions between keratin and starch molecules thus facilitating solubilization of the polymeric films. FIG. 9. Moisture content, moisture regain and water solubility of keratin/starch blend films. Moisture content and regain of films: The mechanical properties, water vapour barrier properties, dissolution, and drug delivery properties of polymer-based materials are significantly influenced by the moisture content and moisture regain of the produced materials [15,18-20]. Moisture content of the keratin/starch blended films was significantly affected by the amount of starch in the films and ranged between 10-16%. Results shown in FIG. 9 indicate that the increase in starch content increased the moisture content of the films: this could be due to the hydrophobic nature of keratin molecules and the crosslink network structure formed between keratin and starch molecules that could hinder exposure of the hydrophilic groups of keratin to water molecules. In contrast starch has good ability to bind with water. But in all cases the moisture content of the films is in the range of allowable moisture content. This indicates keratin/starch films could be stored for long periods at room temperature, with no concerns regarding fungal and microbial growths. 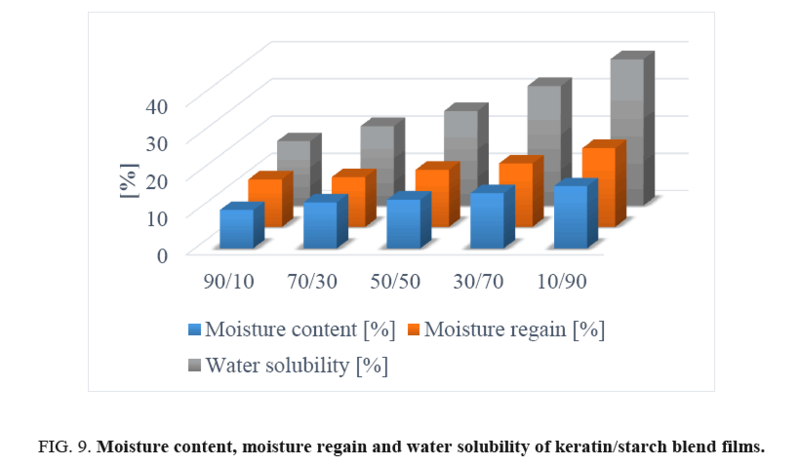 Moisture regain data of keratin/starch blend films are displayed in FIG. 9. Moisture regain of the films is an important property of the films that can be used in determining the measure of moisture sensitivity, water activity, and hydrophilicity of materials. It can also be used to assess the relative physical stability of materials when stored under humid conditions. Also, water regain properties of the films can be considered as an advantage for applications like wound healing, drug delivery system and hygiene. Moisture regain values of films in this study were 12-20%. As can be seen in FIG. 9, increasing starch content in films resulted in increase in moisture regain of the films possibly due to hydrogen bonding interactions and the hydrophilic nature of starch. As is well known higher quantities of hydrophilic group in materials lead to higher moisture content of the materials. The water adsorbed on keratin/starch blended films acts as a plasticiser for increasing chain mobility of starch and weakening inter-chain hydrogen bonding, by which starch chains are capable of slipping, thereby reducing internal stress and thus increasing film elongation. Chemical modification of the starch used in this study may be necessary so as to reduce its high moisture properties and enable production of bioplastic with good water barrier properties. Surface density of the films: One requirement of current packaging materials is lightness. The surface density values of keratin and starch films are depicted in FIG. 10. The values decrease with increasing keratin content in the films. This could be due to the higher density of starch compared to keratin protein. FIG. 10. The surface density profile of starch/keratin film. 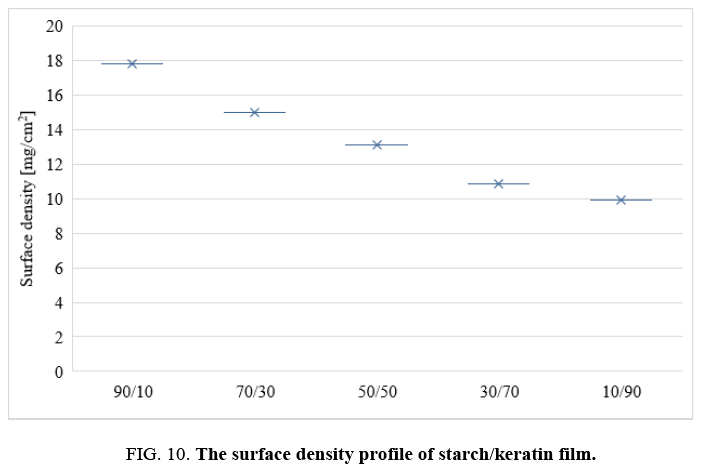 Tensile properties of films: The effect of starch content on tensile strength and elongation of properties of keratin/starch blended films are shown in FIG. 11. Increase in starch content caused significant differences in both tensile strength and elongation properties of the films: samples with lower starch content exhibited higher tensile strength and lower elongation properties than those with higher starch content. FIG. 11 shows that films prepared with 10% starch and 90% keratin had higher tensile strength (15.91 MPa) and lower percent elongation at break/flexibility (9.10%). Whereas films from 90% starch and 10% keratin showed a higher percent elongation at break (26.20%) and lower tensile strength (7.34 MPa). The increase in avocado seed starch results in the decrement of tensile strength, low ductility of the protein matrix and increment of the elongation properties of the films. The increased tensile properties are due to formation of intermolecular hydrogen bonds between NH4+ of the keratin backbone and OH– groups in the starch matrix. FIG. 11. 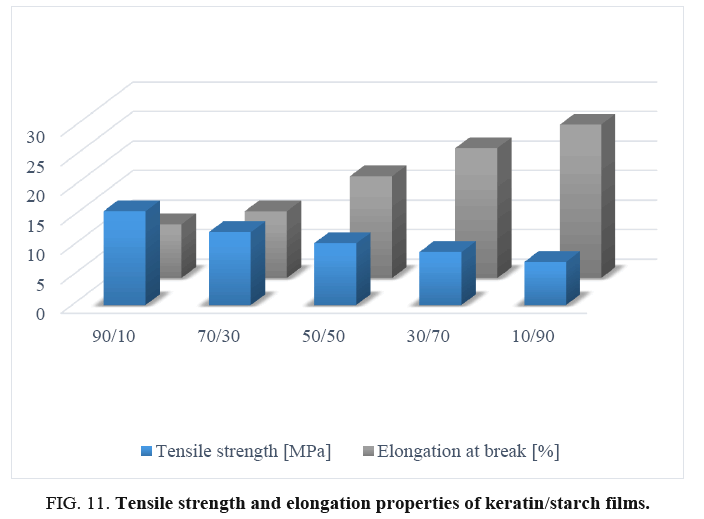 Tensile strength and elongation properties of keratin/starch films. Dissolution of films: The dissolution profiles of the keratin/starch blend films are depicted in FIG. 12. Dissolution decreases as the keratin content in the films increases. 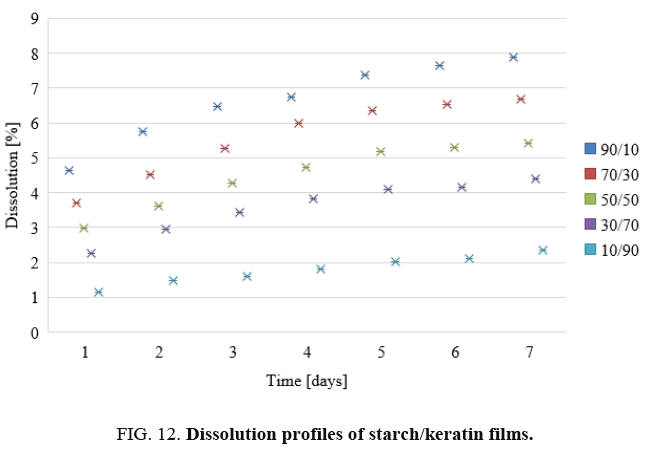 As shown in the Figure the highest percentage of dissolution was for film containing higher starch content, this might be affected by interaction force between keratin and starch. Moreover, the broad distribution of molecular sizes and molecular weights of starch and keratin should be affected on the bonding formation between two components and reflected on degradation pattern of the blended film. FIG. 12. Dissolution profiles of starch/keratin films. The dissolution properties of the films can be used as indicators as to whether the materials could be used as drug release materials. The decrease in dissolution with increase in keratin content may be attributed to the high sulphur content from the amino acid cysteine in the keratin. The chicken feather keratin contains both hydrophobic and hydrophilic regions and the hydrophobic nature of keratin could influence the dissolution negatively. The sulphur-sulphur linkages (-S-S-) also affects the dissolution properties of the films. The starch matrix contains hydroxyl groups that should interact well and affect the release patterns of the films. As the starch content in the films increases, the texture of the keratin/starch blend films undergoes phase separation: consequently, water stability as well as the mechanical properties will be compromised. FIG. 13. 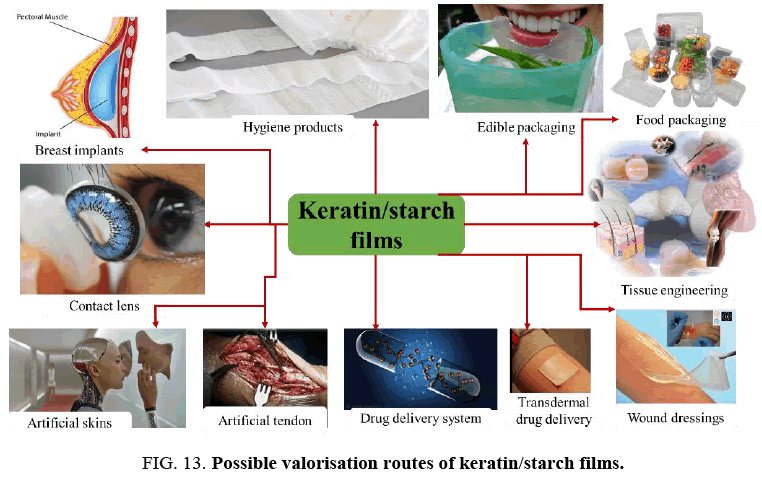 Possible valorisation routes of keratin/starch films. • In the pharmaceutical industry (e.g., drug delivery and transdermal drug delivery systems). Biofilms were successfully produced from starch and keratin obtained from waste avocado seeds and waste chicken feathers. With increasing starch content, the flexibility, solubility, dissolution, moisture regain, and moisture content of the films increases, whereas the tensile strength property decreases. The results of the dissolution, water absorption, solubility, moisture content, mechanical properties and morphological structures of the films imply that they could be used: in the food packaging industry (as a cost-effective and environmental alternative source of raw material to the commonly used packaging materials; as a raw material for various hygiene products, e.g., superabsorbent materials for diaper products; in wound dressings; in the fashion industry (as artificial lens and breast implants); in biomedical applications, e.g., artificial skin replacement; and in the pharmaceutical industry (as drug delivery and transdermal drug delivery systems). Future studies will entail understanding the effect of chemical modifications of starch and keratins, different plasticizers, and extrusion/casting conditions on physiochemical and mechanical properties of the films. The possibility of the film for its drug release and other medical applications would be also analyzed. The authors are highly grateful for the financial and technical support received from: the Thermodynamics Research Unit at the Discipline of Chemical Engineering, University of KwaZulu-Natal; the Institute of Technology for Textile and Fashion Design/EiTEX at Bahir Dar University, Ethiopia; the Department of Science and Technology, Waste Research Development and Innovation Roadmap and the Biorefinery Industry Development Facility, Natural Resources and Environment, Council for Scientific and Industrial Research (CSIR). Ferreira AR, Alves VD, Coelhoso IM. Polysaccharide-based membranes in food packaging applications. Membranes. 2016;6(2):22. Chocyk D, G?adyszewska B, Ciupak A, et al. Influence of water addition on mechanical properties of thermoplastic starch foils. International Agrophysics. 2015;29(3):267-73. Song NB, Jo WS, Song HY, et al. Effects of plasticizers and nano-clay content on the physical properties of chicken feather protein composite films. Food Hydrocolloids. 2013;31(2):340-5. Al-Salem SM, Lettieri P, Baeyens J. Recycling and recovery routes of plastic solid waste (PSW): A review. Waste Management. 2009;29(10):2625-43. Palmu PT, Crosso F. Development and characterization of edible films based on gluten from semi-hard and soft Brazilian wheat flours. Food Sci Technol. 2003;23:264-9. Chaosri P, Thonpho A, Srihanam P. Properties and drug release profile of keratin/starch blend films. J Sci Technol MSU. 2014;33(6):554-560. Cui L, Gong J, Fan X, et al. Transglutaminase?modified wool keratin film and its potential application in tissue engineering. Engineering in Life Sciences. 2013;13(2):149-55. Van Dyke ME, Timmons SF, Blanchard CR. et al. Absorbent keratin wound dressing. U.S. Patent 6,270,793. 2001. Yamauchi K, Khoda A. Novel proteinous microcapsules from wool keratins. Colloids and Surfaces B: Biointerfaces. 1997;9(1-2):117-9. De Carvalho RA, Grosso CRF. Characterization of gelatin based films modified with transglutaminase, glyoxal and formaldehyde. Food Hydrocolloids. 2004;18(5):717-26. Sothornvit R, Krochta JM. Water vapor permeability and solubility of films from hydrolyzed whey protein. Journal of Food Science. 2000;65(4):700-3. Oladayo OO, Joseph OS, Oluwasegun W. Physicochemical properties of cassava starch and starch-keratin prepared biofilm. Songklanakarin J Sci and Technol. 2016;38(4). Sando L, Kim M, Colgrave ML, et al. Photochemical crosslinking of soluble wool keratins produces a mechanically stable biomaterial that supports cell adhesion and proliferation. Journal of Biomedical Materials Research Part A. 2010;95(3):901-11. Zhong QP, Xia WS. Physicochemical properties of edible and preservative films from chitosan/cassava starch/gelatin blend plasticised with glycerol. Food Technology and Biotechnology. 2008;46(3):262-9. Fang Y, Tung MA, Britt IJ, et al. Tensile and barrier properties of edible films made from whey proteins. J Food Sci. 2002;67(1):188-93. Gennadios A, Weller CL. Edible films and coatings from soymilk and soy protein. Cereal Foods World, USA. 1991. Lim LT, Mine Y, Tung MA. Transglutaminase cross-linked egg white protein films: tensile properties and oxygen permeability. J Agri Food Chem. 1998;46(10):4022-9. Saul JM, Ellenburg MD, de Guzman RC. Keratin hydrogels support the sustained release of bioactive ciprofloxacin. J Biomed Mat Res Part A. 2011;98(4):544-53. Tanabe T, Okitsu N, Yamauchi K. Fabrication and characterization of chemically crosslinked keratin films. Mat Sci and Eng. C. 2004;24(3):441-6. Thonpho ANSAYA, Srihanam P. Preparation and characterization of keratin blended films using biopolymers for drug controlled release application. Oriental J Chem. 2016;32(4):1739-48. Garcia MA, Martino MN, Zaritzky NE. Lipid addition to improve barrier properties of edible starch?based films and coatings. J Food Sci. 2000;65(6):941-4. Handa A, Gennadios A, Hanna MA. et al. Physical and molecular properties of egg?white lipid films. J Food Sci. 1999;64(5):860-4. Yang L, Paulson AT. Effects of lipids on mechanical and moisture barrier properties of edible gelatine film. Food Research International. 2000;33(7):571-8. Hill P, Brantley H, Van Dyke M. Some properties of keratin biomaterials: Kerateines. Biomat. 2010;31(4):585-93. Jiang Y, Tang CH, Wen QB, et al. Effect of processing parameters on the properties of transglutaminase-treated soy protein isolate films. Innovative Food Sci and Emerging Technol. 2007;8(2):218-25. Oh JH, Wang B, Field PD, et al. Characteristics of edible films made from dairy proteins and zein hydrolysate cross?linked with transglutaminase. Int J Food Sci and Technol. 2004;39(3):287-94. Rejak A, Moscicki L, Wójtowicz A, et al. Influence of keratin addition on selected mechanical properties of TPS film. Teka Komisji Motoryzacji i Energetyki Rolnictwa. 2012;12(1). Tonin C, Aluigi A, Vineis C. et al. Thermal and structural characterization of poly (ethylene-oxide)/keratin blend films. J Thermal Analysis and Calorimetry. 2007;89(2):601-8. Verma V, Verma P, Ray P, et al. Preparation of scaffolds from human hair proteins for tissue-engineering applications. Biomedical Mat. 2008;3(2):025007. Tesfaye T, Sithole B, Ramjugernath D. Valorisation of chicken feathers: Recycling and recovery routes. Proceedings, Sardinia 2017, 16th International Waste Management and Landfill Symposium. S Margherita di Pula, IWWG: International Waste Working Group, CISA Publisher. Sardinia, Cagliari Italy. 2017a:511. Tesfaye T, Sithole B, Ramjugernath D, et al. Valorization of chicken feathers: Characterization of physical properties and morphological structure. J Cleaner Prod. 2017b;149:349-65. Tesfaye T, Sithole B, Ramjugernath D, et al. Valorization of chicken feathers: Characterization of chemical properties. Waste Management. 2017c;68:626-35. Tesfaye T, Sithole B, Ramjugernath D, et al. Valorization of chicken feathers: Application in paper production. Journal of Cleaner Production. 2017d;164:1324-31. Tesfaye T, Sithole B, Ramjugernath D. Valorisation of chicken feathers: A review on recycling and recovery route-current status and future prospects. Clean Technologies and Environmental Policy. 2017e;19(10):2363-78. Tesfaye T, Sithole B, Ramjugernath D, et al. Valorization of chicken feather barbs: Utilization in yarn production and technical textile applications. Sustainable Chem and Pharmacy. 2018f;8:38-49. Srisuwan Y, Thonpho A, Srihanam P. Effect of starch on property of silk fibroin/keratin blend films. Int J. 2016;11(28):2870-3.